Bead Bazaar is now on Facebook! Want to receive Bead Bazaar updates or just show support for a local business? Click the link below to Like the Bellingham Bead Bazaar! May is here, and with it comes Fairhaven’s Girls Night Out, an annual fundraiser for St. Joseph’s Cancer Center. Fairhaven has decided to fight back against cancer the fun way, by hosting events, holding a fashion show, and inviting you ladies to shop till you drop! Girls Night Out 2011 will take place on Thursday, May 12th. Additional information about this year’s line up of events and participating merchants can be found here. As always, the Bead Bazaar is proud to participate in Girl’s Night Out, and this year all “Awareness” pendants will be 50% off! We’re also offering a “Make and Take”: a fun project that you can make while guided by our helpful staff and finish within the evening; take it home or show it off at the Girl’s Night out fashion show! To participate in our “Make and Take”, just make sure to stop by the store between 4PM and 8PM. Our “Make and Take” is a whimsical beaded flower pendant with an exquisite filigree backing. 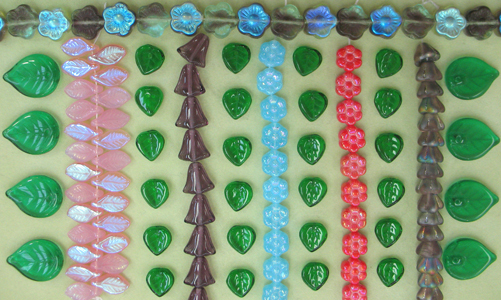 Czech glass flower petals will be available in a variety of springy hues, perfect for customization. The average cost of this “Make and Take” project is $20, but remember that cost can vary depending on choice of supplies. We will also be showcasing a beaded necklace and earring set for the Girls Night Out fashion show; make sure to check our blog next week for a peak at our show-stopping design! In the mean time, ladies can purchase Girls Night Out passports and check out our “Make and Take” sample here in our store. Remember, your $10 passport gives you access to all of the festivities, including raffles, the fashion show, and a comedy show! Make sure to pick yours up as soon as possible! Clearance Sale: This weekend only! This Saturday, April 16th, Fairhaven is celebrating the return of the Schooner Zodiac to the Bellingham Port with vessel tours, day sails, and boat races; the harbor is sure to be abuzz with activity this weekend! In honor of Fairhaven’s festivities, the Bead Bazaar has discounted many of our designer strands of Czech Glass. Good through this Monday, select strands are 30-50% off! Catch the maritime spirit with specialty beads in shades of aquamarine, cobalt blue, and sea green, or revel in any color ranging from bubblegum pink to burnt orange. These beads would be lovely gracing a nautically themed bracelet or an oceanic art project. New arrivals to the store include a vast collection of springy designer Czech glass beads (these are not included in the discounted strands). Their soft hues spell perfection for Easter projects; for an extra hint of Spring, you can pair our Czech glass with our new Thai-style pewter charms! Whether mixing these darling pewter buds with discounted Czech glass leaves or livening them up with vibrant hues, these are a hit that works for any buget! Be sure to stop by for our weekend special, only good through Monday, April 18th! We’ll be seeing you soon! 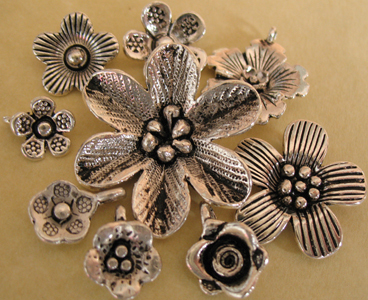 April showers bring spring flowers, especially at the Bead Bazaar! In celebration of April’s seasonably rainy weather, we’re giving away a FREE strand of springy Czech glass flowers and leaves with any purchase that exceeds $25! This give-away is good through April 30th, so don’t hesitate to cultivate your garden of beads. There’s no better way to banish those rainy weather blues than with a fun crafting project. Bedeck yourself with the bright colors or soft pastels of blossoms as you gear up for the sunny seasons to come, or indulge in a lush leafy look made exclusively of foliage beads. Though April showers may come our way, the Bead Bazaar invites you to play! 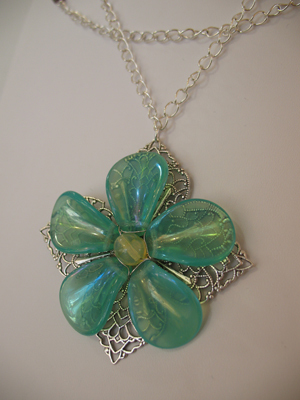 Come in and check out our refreshing floral pieces, whether in Czech glass, artisan glass, or lucite. We hope to see you soon!